Yes, it’s a bit cold although not too bad for the time of year. Yes, it’s very wet and conditions are not conducive to smacking the ball long distances. It’s not great for hitting cute shots from the rough either. The environment becomes all-consuming at times. It starts with clothing and more equipment to carry and think about. You’re taking your wet weather jacket off then putting it on again. The umbrella opens, closes and gets put away and by the time you’ve done all that, you forget you have a shot to hit. The game becomes more about managing the environment. Rather than focus on the bit of the game that’s enjoyable – hitting the ball. One minute you can’t see the ball because of the low sun, the next it’s so grey you can’t see it because of the clouds. You need to manage where you walk as it’s so slippery and muddy. The greenkeepers protect the greens by roping off sections. You’re forced to wind your way along unfamiliar paths to move from hole to hole. All this fills your head up with unfamiliar constituents. It means there is so much more to think about and manage than normal. What I want to do is focus on the bits of the game that are important. The elements that I practice and enable me to hit a good score, so I can win. … I don’t practice when it’s raining. … I never practice managing an umbrella in the wind whilst trying to spot my partners shots. … I don’t think I’ve spent time learning how to hit balls out of the mud either. … Or, finding it when it’s covered in the stuff and there are leaves everywhere. … I’ve not worked on hitting the ball from weird and wonderful places on the course that I’ve never been before. … Nor do I spend time hitting balls on the range wearing what seems to be eighteen layers of clothing and wet socks. It’s something I need to consider if I want to get much better than I am now. I seem to have hit a plateau. I’m not playing badly. In fact, I’m hitting the ball well. I’m not managing the circumstances within which I’m playing. The trouble is that I’m not a pro – nor do I have any intentions of being one. I do want to get better. But, I accept that these distractions when I play are part and parcel of the process I’m going through. It’s a temporary situation which will resolve itself and there will be no long-term harm done. I recognise that the game I’m having to play now is being played under different rules and I’m okay with that. It will pass – no harm done. Over several winters, I’ll build resilience to these conditions. I’ll find methods to manage the environment and it will become less impactful. Your business is also “played” within a certain set of conditions that you consider normal. Your planning and intentions are based on these conditions. Yet, we still allow challenging environments to disrupt the normal flow of play. You go on a training course to learn how to do something that will benefit the business. Something to increase revenue and profits. You get all excited about it and may even set aside time in the diary to implement it. Or, you decide that this year, you will always run a weekly management meeting. This will set a clear outcome for the week and create a better team feeling. Or, you make the move to cloud accounting. You spend time with your accountant laying out how you’d like it to work and maximise useful reporting. Or, you make the decision to not work Fridays anymore. Because you can – it’s your business and you get to choose when you do and don’t work. #idontworkfridays. That’s a real hashtag by the way. You get to the point in your diary that you’ve set aside to put in place your new revenue-generating super-power. Except that you discover that there’s not as much cash as you thought to pay for the ads. And that your marketing manager/director/outsourcer doesn’t understand it. Maybe it would be better left until Q2. You add it to the pile of other stuff that you’ve learned but never quite seem to get around to implementing. Monday morning comes around and it’s time for the management meeting. You’re all excited and ready to go. You turn up early in the newly tidied boardroom, biscuits and coffee ready to go. Julie from accounts is first but looking harried. “I’ve only got 10 minutes as the VAT is due yesterday”. Tim from sales ambles in, shouting into his phone. Marcus, your grad marketer rushes in, apologising for being late. The ad-words account is 0.0003 % down in conversions and he can’t work out why. You start, no one has the agenda, it takes 20 minutes to get through the first point (which is the sales report). Tim is still on the phone. Martin from ops saunters in halfway through, says he’s too busy and walks out. The Monday morning fire alarm goes off- everyone walks out. You sit down with Julie to go through the new cloud accounting system and ask her to pull off the first report. Except she doesn’t know how, and she’s too busy and what’s wrong with my spreadsheet anyway? And don’t you know, the VAT is due? You’re going to start with a half day. I mean, the team will think it’s unfair if you’re not there. There’s so much to do anyway. You can use the time to catch up on the stuff you couldn’t get done earlier in the week. You could work out the accounting reports yourself. You see, we may have the best intentions for our business. We may go on training courses, invest in new software and put a structure in place. … But we set our intentions against an ideal environment. The one that we picture in our heads. The one where everything works. What we don’t do is allow for how to play this game of business when the conditions are not ideal. Worse, we don’t manage the environment it’s played in. When I practice my golf in my head, the sun is always shining, I’m always wearing shorts. It’s never that simple is it though? Perhaps I need to practice in the rain more often and learn how to deal with it. Perhaps we all need to learn to manage our environments when we’re playing business too. "can dig out your blind-spots ten paces before you can"
Challenging the status quo is what Ash is good at. 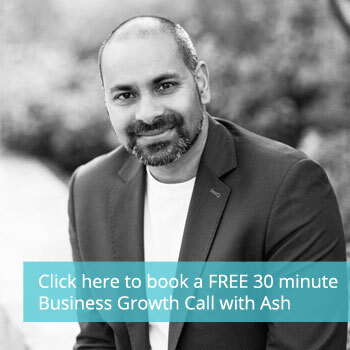 Having worked with Ash consistently over the last four years has been nothing short of an excellent business coach who can dig out your blind-spots ten paces before you can. If you are after a business coach who thinks outside the box with questions to challenge you means that it’s a good sign of helping you grow way beyond where you are to get to a targeted growth of a consistent £10k per month. What he has done for me and my business, I cannot thank Ash highly enough, and would highly recommend others to him without hesitation. "works to very high standards, but he's also a lot of fun"
Ash is not your average business coach. He hasn't just left a corporate role, taken some coaching courses, and positioned himself as an expert: he's got where he has the hard way. His extensive background as a hands-on tennis coach means he knows how to deliver effective coaching, at every level. His experience as the owner of a business with multiple moving parts means he can genuinely understand, and empathise with, his clients' highs and lows. Since I've been working with Ash — including as a member of one of his mastermind groups — the difference he's made to my business and to my confidence in my ability to succeed has been tremendous. He's a man of the highest integrity who works to very high standards, but he's also a lot of fun and just one of the nicest people you'll ever do business with.